Ask any automotive enthusiast which vehicle is the most reliable and they'll tell you any vehicle's last model year is likely to be the least troublesome. That should be good news for anyone considering a 2017 Chevrolet Traverse. Having been on sale since late 2009, the Traverse may well be in its last year of production in its current form. Other GM family members--like the GMC Acadia, which was mechanically related to the Traverse up until this model year--are changing significantly in 2017. We held this preview until after the major auto shows just to be sure the Traverse was not following suit. At this time, however, we expect the 2017 Traverse to remain largely unchanged. The 2017 Traverse will remain the largest crossover in the GM lineup. Its three rows of seating can be configured for seven passengers with middle-row captains' chairs or eight with a middle-row bench seat. The third row seats three and is spacious when those passengers are children. And even with all three rows deployed, the Traverse offers 24.4 cubic feet of cargo area. Compare that to a Chevy Malibu’s 15.8 cubic feet of trunk space and you see why families are rapidly migrating to crossovers. Dropping the second and third rows of seats gives you whopping 116.3 cubic feet of cargo capacity. If you think the Chevy Tahoe SUV is a larger vehicle, consider this: its cargo capacity is only 94.1 cubic feet with the second and third seats stowed. Herein lies the first advantage crossovers have over SUVs--they package their mechanical components better, leaving more room for you and your stuff. Although Chevy markets the Traverse as an SUV, presumably to imply its rugged ability, its unibody design actually makes it a very large crossover, like Ford’s Explorer, as opposed to body-on-frame SUVs like the larger Chevrolet Suburban and Tahoe. But there's no real downside to unibody construction except when it's used for heavy-duty towing. Benefits of a unibody crossover include a lower weight, which translates to slightly better fuel economy and improved passenger safety. All 2017 Chevrolet Traverse crossovers will use the same drivetrain, a 3.6-liter V6 with 281 hp, or 288 on trims with the dual exhaust. The engine mates to a 6-speed automatic transmission, and both front-wheel drive (FWD) and all-wheel drive (AWD) are available. 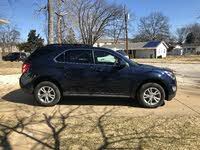 The Traverse also has enough oomph to tow up to 5200 pounds. Towing specifications are always hard to relate to real-world towing capabilities, but consider that the Traverse could tow another Traverse behind itself and you get a pretty good idea of just how much this crossover can pull. At almost 5,000 pounds, the Traverse is a big fellow. In combination with the hearty drivetrain, fuel economy in AWD versions is 16 mpg city/23 highway/19 combined. FWD models also have a combined 19 mpg, so there are no fuel economy benefits to forgoing the AWD system. For comparison, the Chevy Tahoe gets 18 combined and a 2016 Honda Pilot gets 22 combined. Safety is good in all large crossovers, but the Traverse has not been fully tested by Insurance Institute for Highway Safety. It scored Good on the limited crash tests conducted and offers an optional basic forward collision prevention system. 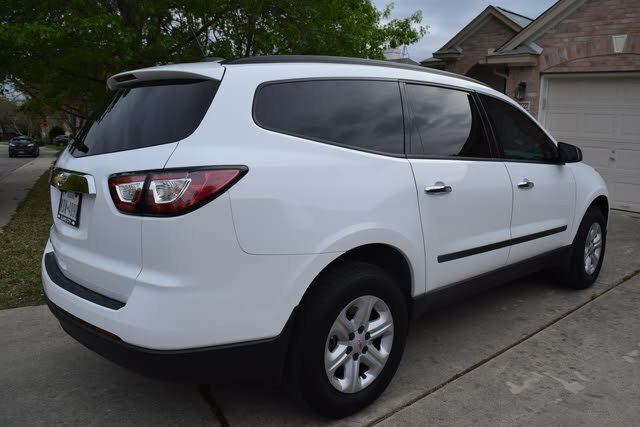 Though it has not been listed a Top Safety Pick like most vehicles in its class, it is hard to look at the Traverse and not have a sense that it's a solid, safe family vehicle. Chevrolet is a leader in in-vehicle technology and connectivity. Unlike some premium brands, Chevy keeps its infotainment system simple and easy to use, offering popular features like 4G LTE Wi-Fi, which is available with a data subscription. Apple CarPlay and Android Auto should be available as well, but buyers should check with their dealer on this. The Traverse has one USB port in the front and two in the second row, and there is an available second-row entertainment system, though these systems are growing less relevant as smartphones become the defacto entertainment system for children of all ages. Expect the 2017 Chevrolet Traverse to start at around $33,000. Fully-equipped AWD LTZ trims will approach $50,000. There is no definitive launch date for the new model year, but since this may be the last year of production for the current Traverse, it would not be a surprise if the 2017 came in late 2016 and ran for about 16 months. What's your take on the 2017 Chevrolet Traverse? Users ranked 2017 Chevrolet Traverse against other cars which they drove/owned. Each ranking was based on 9 categories. Here is the summary of top rankings. Have you driven a 2017 Chevrolet Traverse? Auto Shut Down Stopped, At Traffic Lights. 2017-18 Chev Acadia/Traverse when stopped, waiting for a light to change, or traffic to clear, the engine shuts off. Saving fuel, lowering emissions? Any way for a user to shut off this feature?